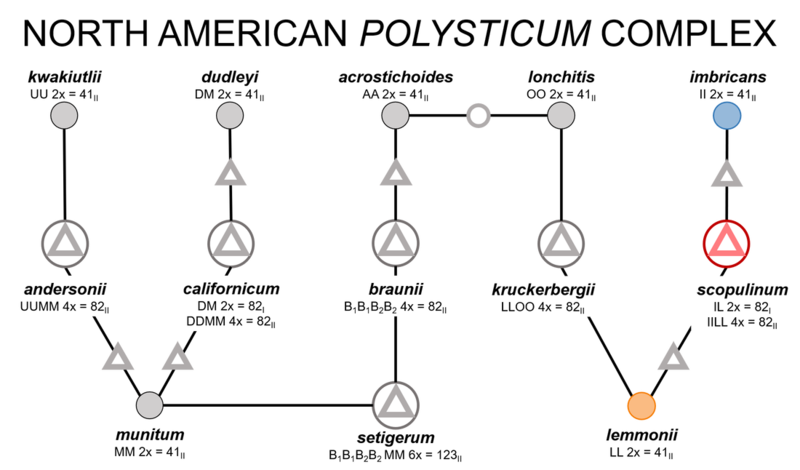 Whole-genome duplication (WGD), or polyploidy, is the condition of having more than two homologous sets of chromosomes and can arise from the duplication of genomes within a species (autopolyploidy) or in hybrids between two different species (allopolyploidy). Polyploidy is thought to be an important driver of plant evolution by facilitating diversification and speciation, yet the mechanisms behind the ecological success of polyploids remain poorly understood. Especially limited is our understanding of how/when polyploidization drives the evolution of novel physiological traits, and how those traits determine species' distributions. This work aims to identify the extent to which variation in physiological traits are due to polyploidy and the impacts on species distribution and ecology. 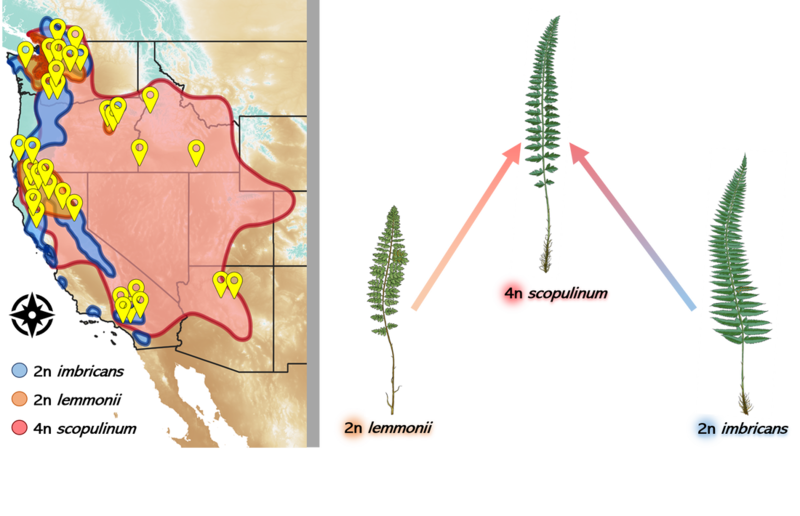 ​Ferns are an ideal group in which to study polyploidy because over 31% of speciation events in ferns involve changes in ploidal level, compared to only 15% in angiosperms. One of the largest and ecologically diverse polyploid fern complexes in North America is in the genus Polystichum. In particular, the allopolyploid P. scopulinum is an allotetraploid that exhibits significantly expanded ecological range and habitat novelty compared to its progenitors, P. lemmonii and P. imbricans. Which traits have evolved in P. scopulinum that explain the dramatic range expansion and niche novelty? To begin answering these questions, I flew west and hunted populations of all three species. Over the course of two field seasons I samples over 30 sites at key locations within the ranges of the two diploids and allopolyploid species in an effort to capture a significant degree of their niche breadth. Some of the things I collected were soil samples for pH, P, K, N, Mg, Ca, Ni, Zn, and Pb, and leaves for the exact same elements to understand soil resource utilization. Additionally, I conducted CO2 response curves with fluorescence in situ to estimate photosynthetic parameters including maximum rates of carboxylation (Vcmax), electron transport (Jmax), stomatal conductance (gs), mesophyll conductance (gm), and net photosynthesis (Amax). I also analyzes samples for water use efficiency from carbon isotopes (d13C), specific leaf area (SLA), stomatal traits (size and density), vein density (VLA), and the hydraulic anatomy of xylem supplying the leaves (Kth). Oh, and I collected spores to grow gametophytes for further experiments. This work is in collaboration with Dr. Emily Sessa, Dr. Rob Guralnick, and Dr. Pam Soltis from the University of Florida, and Dr. Kate McCulloh from the University of Wisconsin-Madison.